Mensusa https://www.mensusa.com/articles/get-attractive-and-stylish-look-in-banded-collar-shirts.html Get Attractive And Stylish Look In Banded Collar Shirts With Men's Leather Jackets Here is a perfect guide that outlines the various ways to match banded collar shirts with men's leather jackets and leather bomber jacket while maintaining an attractive and stylish look. Here is a perfect guide that outlines the various ways to match banded collar shirts with men's leather jackets and leather bomber jacket while maintaining an attractive and stylish look. Banded collar shirts are surely a trend for rational and simple men who relish at expressing their personality through the dressing. These are common attires for genteel and decent men since these banded collar shirts are best at imparting a formal look. Each authentic piece features a banded collar, partially covered front placket, six-button front, flapped front pockets, and a slim fit construction. All these qualities feature in our many selections of banded collar shirts. Each of our shirts features a flawless banded collared design and 100% cotton to work smoothly with any machine wash or dry cleaners. Its slim fit shape ensures to fit different men's stature and size. We fully stock our stores with different colors, sizes, designs, and styles of the banded collar shirt at a very reasonable price. We believe we have something to any man; all you have to do is claim yours at our mensusa.com today! 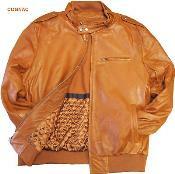 Most mens leather jackets feature a tough construction made from various animal skins mainly bull and lambskin. With different types of animal skins, leather jackets are made of different qualities and colors. The quality of the leather material used determines the durability of your leather jacket. At mensusa.com, we stock various sizes, colors, and designs of mens leather jacket to suit the many disparities in stature, sizes, and standard among men. Any superbly designed and medium colored mens leather jacket will perfectly complement the banded collar shirt to bring out the classic look of you. These authentic leather pieces are most appropriate when worn in cold seasons or for bike riders since it provides adequate protection and warmth to the wearer. It doesn't matter the color of the leather jacket, all mens leather jackets are always easy to clean and maintain. If you desperately need one, reserve yours today at a reasonable price at mensusa.com. The long brown leather coat features pure polyurethane leather with fleece inside, and slim fit stand-collars forming a thick and tight construction suitable for cold weather. These leather pieces have button-ups or zip-outs zippers or both and a knee length. There are also superbly crafted with fully lined and soft leather. Some are made with cashmere linings and rib sleeve cuff style to add the coat's eminence. These long brown leather coats also feature vertically skewed front and inside pockets and a rear vent. 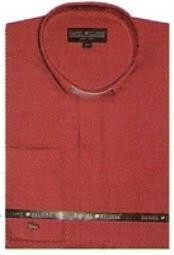 Its versatility allows it to complete the various types of banded collar shirts. With all these excellent features, this leather coat is surely the best covering a man can have in his apparel. We have these vintages in plenty and at reasonable prices, visit our mensusa.com store and select your perfect fit from our large collection of long brown leather coats. Leather bomber jackets that completes your look. Most leather bomber jackets today are expertly crafted from authentic leather fabrics and thin-insulated lining zip-outs. Each customer has to choose their perfect match from our all-time versatile slim and modern fit coats that easily complements any band-collared shirt. With various varieties of leather bomber jackets, you are guaranteed an exceptional and top-quality construction that imparts an ageless and decent look. Tanner avenue leather products are the best-known premium quality and excellently furnished leather outfits. Equally, a tanner Avenue leather jacket is made with superior workmanship by tailoring authentic pebble-grain lambskin leather fabrics together to form a tough but sleek design. These jackets feature shoulder epaulets, tough YKK zippers, an inverted pleat back panel, and leather covered button closures and zippers to enhance convenience and comfort. They also feature wool quilted satin lining, knit cuffs, and front cargo pockets. With all these superior characteristics, the tanners Avenue leather jacket is the best jacket to have in your closet. 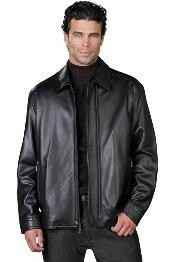 We offer different sizes, designs, and styles of leather jackets to suit men of different stature, taste, and standards. As a bonus, all the leather coats listed above will go perfectly with any banded collar shirts. Our prices are also fully scrutinized to ensure that each customer gets what he seeks without any worries about overspending. To enjoy these fantastic offers and many more, visit mensusa.com and check out our online store.